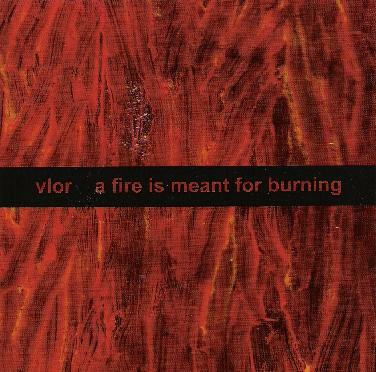 Vlor - "A Fire is Meant for Burning"
Vlor was originally the duo of Brian John Mitchell (Remora) and Russell Halasz, who formed the band to do acoustic guitar covers of Cure and Bauhaus songs, though they went on to record experimental guitar works. Halasz has since moved to Florida, through in 2005 Mitchell recorded 90 minutes of guitar riffs and arpeggios which he sent to various friends to complete as songs, and resulted in the 10 collaboration tracks on A Fire is Meant for Burning. Contributors include Jon DeRosa (Aarktica), Nathan Amundson (Rivulets), Jessica Bailiff, Jesse Edwards (Red Morning Chorus), Paolo Messere (6P.M. ), and Mike VanPortfleet (Lycia). The CD opens with "Trust in Weapons", a duo guitar piece with Jon DeRosa that has a nice melody but plods along a bit too much. Things get more exciting with the next track, "Wires", which nearly everyone contributes to. I love the mixture of dark intensity, trippy psychedelic vibe and spacey electronics on this tune. "Potential New Sound" is somewhat similar but far less intense. It's dark and foreboding, but at the same time light and dreamy, and includes multiple layers of instrumentation with an interesting variety of textures and effects. "Houses Not Homes" and "New Machine" are duo pieces with Paolo Messere that are like lo-fi rock 'n drone tunes. The former is a simplistic rock instrumental but nicely embellished by atmospherics and effects, while the later is far busier and involved, in part due to the interesting use of percussion. "Suncatcher" is a short song that I enjoyed with vocals by Jessica Bailiff. Just a really nice guitar and piano tune. I've not heard of Jessica before but a web search revealed that she's got a few albums out on the Kranky label. I'll have to seek out some of her music. "Days Like Smoke" is a another dreamy atmospheric piece with slow moving guitars that drive the piece over a cool howling meditative backdrop. There are a number of tracks along the lines of "Trust in Weapons", that according to the promo sheet Mitchell would probably describe as minimalist guitar experiments, but they didn't really hold my attention. However, the strong tracks are very good and I suspect that most fans familiar with the contributing artists would find much to enjoy here.